Brownies are a crowd favorite, dense and rich, chocolaty and moist, just fantastic. I figured why not stack them and create a dish worthy of a dessert centerpiece at any holiday or other occasion. Frosted brownies are a real treat, especially when laced with a tangy cream cheese. This version presents brownies in a whole new light, almost upscale compared to just squares on a plate. 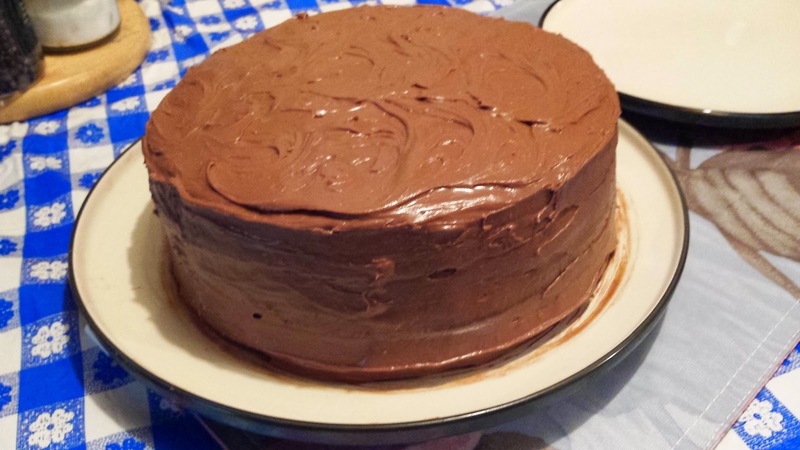 For this recipe I used chocolate chips, cocoa powder and chocolate syrup, also a particular blend of both cake and AP flour for textural variance. The brownie cake turned out wonderful so be sure to make it when it can be shared liberally, lest you may want to eat it all by yourself! Grease and flour three 8 inch cake pans. Combine flours and other dry ingredients and stir well. Using a stand mixer at medium speed, cream sugar, butter and oil. Add eggs, ,one yolk at a time, until incorporated. Blend in chocolate syrup and vanilla. Alternate blending portions of flour and coconut milk , ending with flour. Make sure to scrape the bowl sides down throughout to catch any pockets of flour or ingredients. Distribute evenly among the three pans. Bake until toothpick inserted comes out clean, about 25 minutes. Set aside to cool. 6 oz. semisweet chocolate chips w/ 2 tbsp. coconut milk, softened in microwave or by double boiler. Combine ingredients under medium speed until desired consistency is reached. Place in refrigerator for 10 minutes to stabilize frosting until ready to use. Once brownies have cooled, cut each round in half crosswise, creating 6 layers. On desired dish, add a bit of frosting to stabilize structure and begin to add each layer, frosting and layering etc. Once 6 layers are in place, frost sides, then top. I found this recipe to be a delicious and fun one, especially with the implement of a silicon bundt cake pan. I accomplished several things. First, distribution of the meatloaf is so that cooking time is reduced, even though I used a three pound package of ground turkey. Next, with this form, there is more surface area for the wonderful glaze to present itself with just about every bite. Additionally, this makes for ease of slicing later and perfect for sandwich or serving portions. Most importantly, my youngest daughter Bronwyn LOVED it! The super plus of this main course, which I realized while cooling, is the space in the center is a suitable well for roasted or mashed potatoes, vegetables or fresh herbs for presentation. 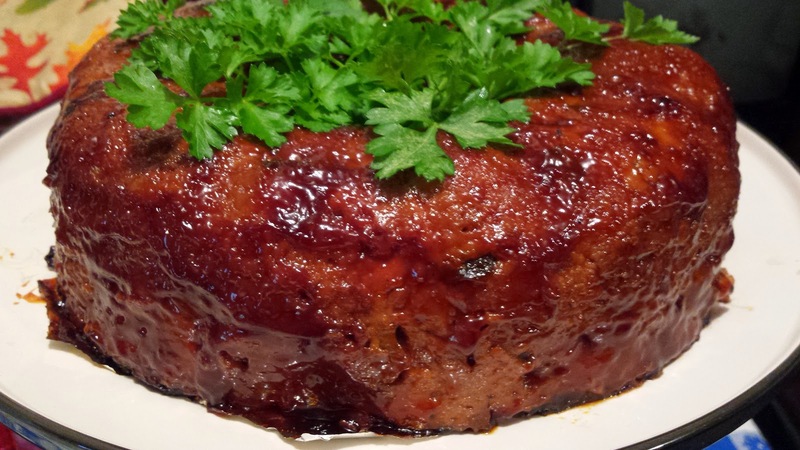 You may also embellish the serving plate with roasted sides of a round, oblong or oval nature, creating a very colorful and festive meatloaf indeed!! Happy Holidays! In a microwavable bowl, combine green pepper, onions , garlic, hot pepper paste and bouillon cubes. 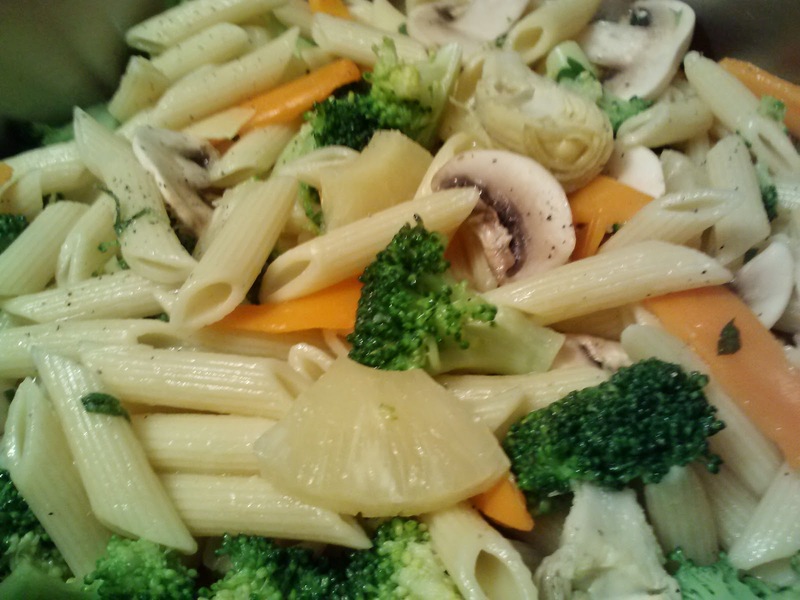 Microwave for 5 minutes or until veggies are softened and aromatic. Set aside to cool, DO NOT drain. When cooled enough to handle, combine with ground turkey and rest of ingredients. Spray or grease the bundt pan and spread meatloaf mixture evenly. Place on baking sheet and bake until internal temperature reaches 165 degrees, about 30 minutes. Midway through cooking, carefully pour off accumulated juices and fats. This will be done a total of two times during the cooking process. RESERVE some of the juices (skimmed of excess fat and strained) for the glaze. Remove meatloaf from oven and carefully invert onto another flat baking surface. Place back in oven and continue to cook for about 5 minutes, while you prepare the glaze. Bring items up to a boil in a small saucepan. Continue rolling boil for several minutes until slightly thickened. 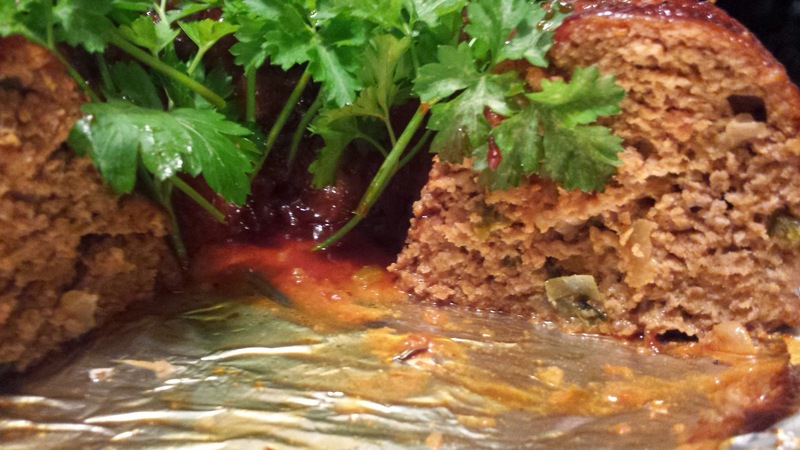 Remove from heat and paint onto meatloaf, baking several minutes more. Turn on broiler and paint meatloaf again, letting go until meatloaf surface starts to caramelize. *I used fresh parsley from my herb garden for sake of time constraints. I can't wait to play around with filling it with side dishes!! Pork Chops , Loaded and Smothered! This recipe is packed with some simple goodness like fiber loaded black beans and leeks, resting atop a roasted chop and baked in an Alfredo sauce, sprinkled with crushed white corn tortilla chips. The crunchy topping pairs well with the simmered black beans and leeks. The chops turn out tender and flavorful from roasting and the Alfredo's creaminess makes for a fantastic comfort dish. For sake of calories and fat, one may easily substitute the rich Alfredo for individual slices of cheese like Monterey Jack or White Cheddar. The results will be equally pleasing. My family really enjoyed the dish, especially my mom and sister Bonnie. Next time I prepare this dish I will be using the individual sliced cheese method, so I can make it more often! In a medium saucepan over medium high heat, add beans, leeks, stock and garlic. If using the soft bouillon, add one cup of water. Bring up to a boil, then reduce heat to a simmer, uncovered, until liquid is virtually evaporated, about 15 minutes. Meanwhile, toss chops with cumin, coriander, drizzle of olive oil and SPST. Roast on roasting pan with rack until golden, about 12 minutes. Remove from oven and transfer to a 3 quart baking dish. Spoon equal portions of bean mixture atop each chop and pour sauce over all. 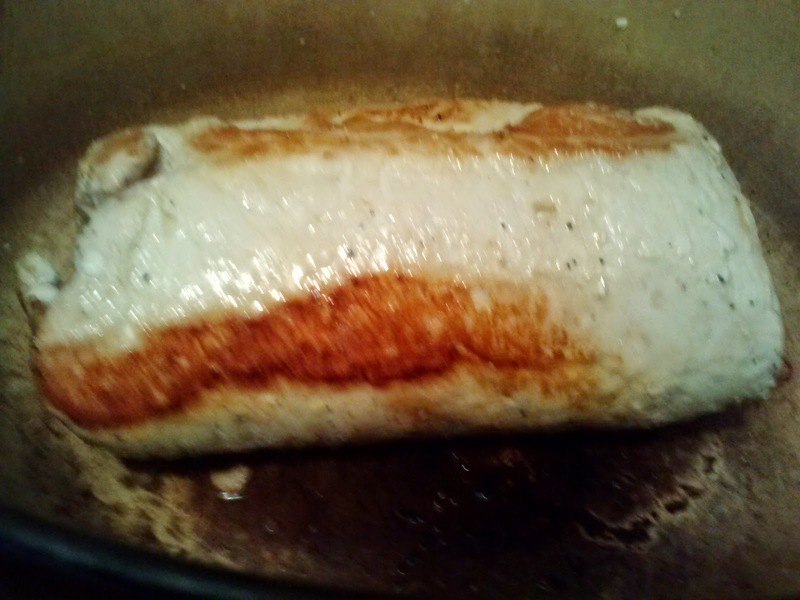 Cover tightly with foil and bake until sauce is bubbly, about 20 minutes. Remove foil and bake uncovered for last 5 minutes to crisp the chips on top. Jump into this fall weather feet first ,with this warm and hearty casserole, embellished with some cool summer flavors and colors. Lots of fresh herbs potatoes, leeks, and quick marinated chicken form a outstanding profile, while the tomatoes and avocado add even more B vitamins , lycopene, (tomatoes) plus heart healthy unsaturated fats and the ability to help the body absorb more of the nutrients from other ingredients in the dish (avocados). Assembly is easy and this dish may be prepped ahead of time and baked when needed. The casserole servings rest on a bed of tortilla rounds, adding a savory crunch and more texture, pairing well with the fresh salad atop. The family received this dish very well and I look forward to preparing it again soon, real soon! 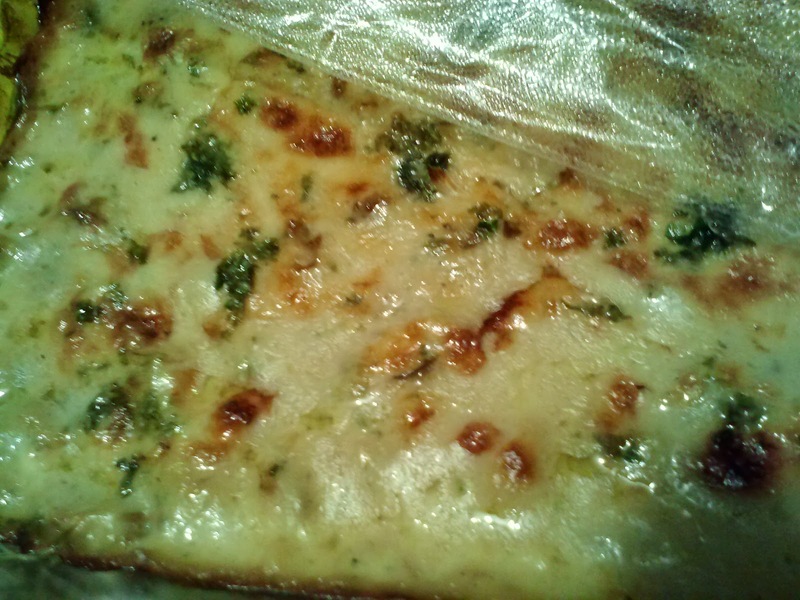 Drain and toss with parsley and a drizzle of olive oil. 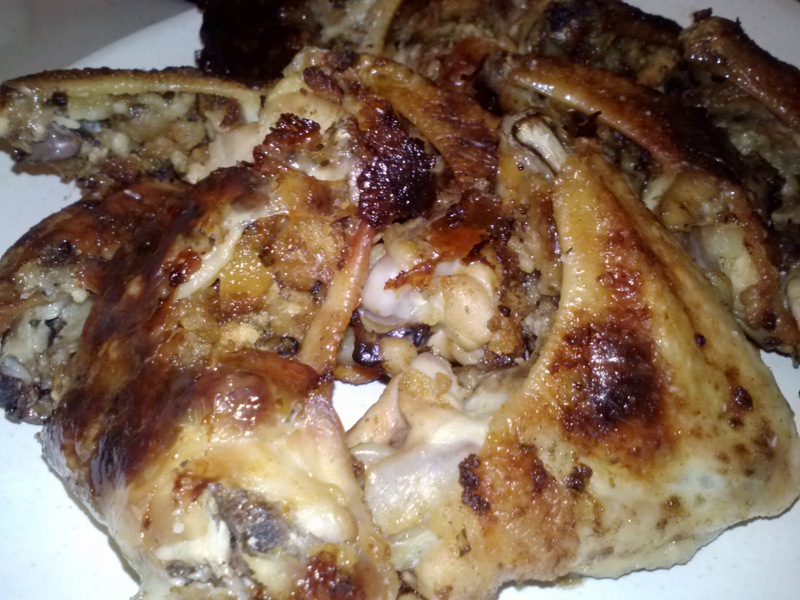 Toss chicken with garlic, thyme leaves, hot pepper paste, chili powder, coriander, cumin, onion powder and lime juice. Drizzle with olive oil and SPST. Fold until well coated. Let marinate for 15 minutes. Meanwhile, preheat oven to 375*F.
Saute chicken pieces over medium high heat in a large saute pan drizzled with olive oil, until no longer pink and show signs of browning. In a 3 quart baking dish, spread potatoes evenly. 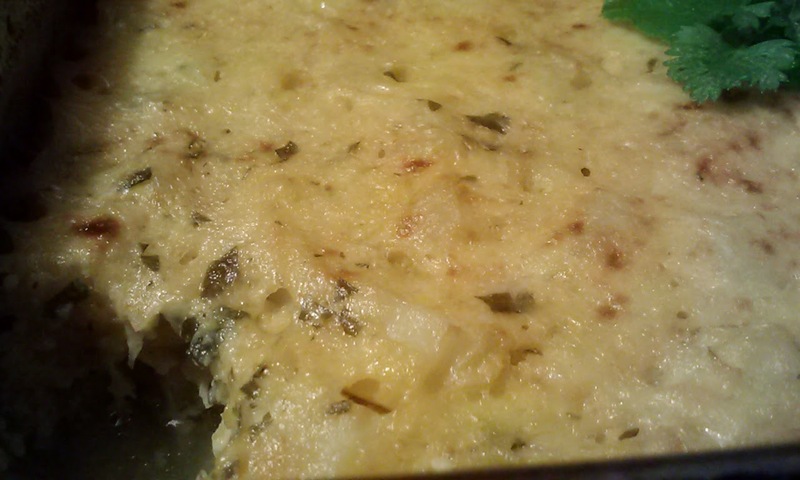 Spread leeks atop potatoes and sprinkle on 1 cup of the cheese. Spread chicken atop cheese and top with remaining 1 cup of cheese. Cover tightly with foil and bake for about 25 minutes, or until potatoes are fork tender. Remove foil for last 5 minutes to slightly brown top. 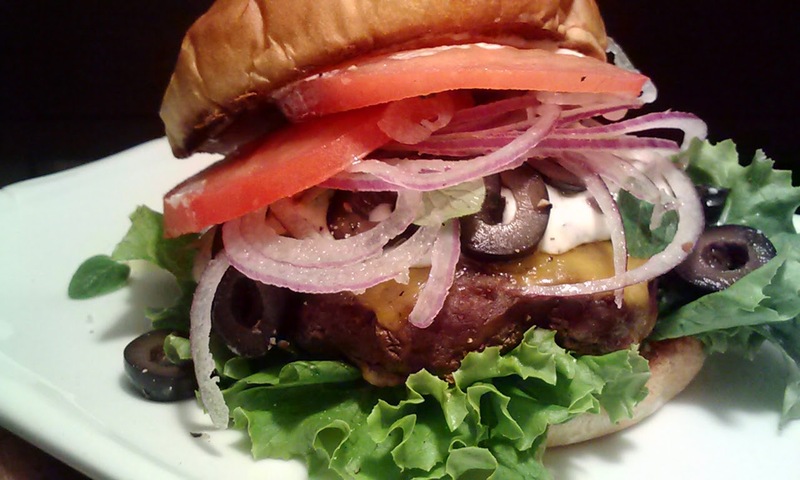 Flavors from Greece and an American favorite hit head-on for a fabulous burger that's a fast 3 course meal in one. The patty is 1/4 pound of ground beef and the fixings are packed with fantastical Greek salad ingredients including a healthy dollop of store bought Tzatziki sauce. Fresh whole leaves of oregano, from my herb garden, bring bright and fresh highlights to this sandwich and marries perfectly to the toasted Potato bun. This dish is super for a speedy dinner night , especially if you have become bored with just plain old burgers and fries. You may easily substitute another protein like lamb, turkey, chicken or pork, depending on your preference. The ready to cook beef patties, however, lend to the time saving aspect and represent the dish very well. Good ole American Sharp Cheddar seals the proverbial deal for a delicious, nutritious and kinda messy meal, bring plenty of napkins! Cook beef patties sprinkled with a scant amount of seasoned salt and cumin to 160*F or desired doneness. Add 1 slice of cheese to each. Meanwhile, drizzle the separated buns with olive oil and toast under the broiler. Smear buns with a small amount of Tzatziki to act as a glue. Place green leaf lettuce leaf or two on bottom bun. Place a large dollop of Tzatziki sauce on top of burger. Add sliced olives, onion, tomato and fresh oregano leaves as desired. SPST and drizzle with olive oil. 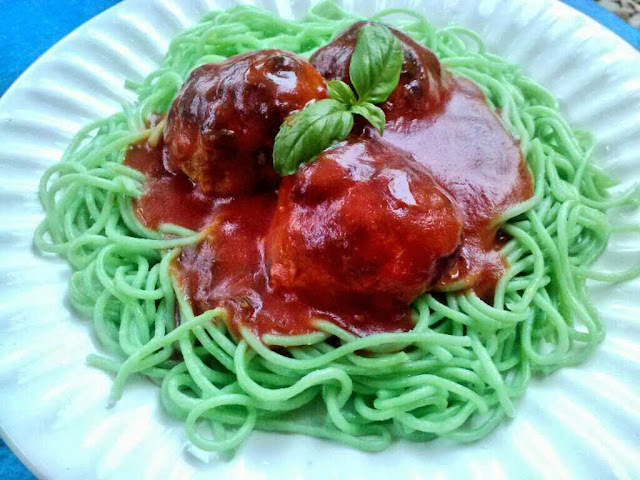 Halloween Fare, Monster Meatballs and Green Spaghetti! Aside from the kids ghastly menu for their Halloween party this year, I wanted the adults to be in on the fun, so I created something including the big kids, a.k.a. parents. This recipe is simple and fun to make, especially with the kiddies. The colors and presentation of this dish really sing Happy Halloween to the fullest of praises! I am entertained just as much as the youngsters during this time of year and I constantly try to keep the excitement going. With this recipe, you won't have to deviate from a recipe you probably already have, just create extra large meatballs, then tint the pasta water with some green food coloring. One meatball would be a serving for the children, and two to three for adults, depending on appetite of course. Just in case you want a refresher course, here's a super simple recipe to have a Howling good meal and Spooktacular reviews for your creativity! Bring ingredients up to a boil over medium high heat, then reduce to a simmer, stirring often until ready to use. Combine all ingredients in a large bowl, I like to use a wooden spoon or long tined fork. Let mixture stand for about 15 minutes for flavors to meld and onions to hydrate. When ready, roll mixture into meatballs roughly the size of a large plum. In a large saute pan, drizzled with olive oil over medium high heat, sear meatballs on all sides in batches. Transfer to roasting pan with rack and bake until internal temperature reaches 165*F and juices run clear. Prepare pasta according to package instructions, adding a few drops of green food coloring to the water. *For finicky eaters, omit the onion soup mix and add 1 tbsp. onion powder and 2 tsp. powdered bouillon. Chicken livers are a great, plus inexpensive way to load up on Iron , protein, zinc, B vitamins , vitamin A and Folic acid. There are many ways in to prepare them, this being one of my favorites. This method provides a wonderful and satisfying crunch to contrast with the supple interior. I like to marinate these puppies before frying them to enhance the flavor profile and give a magnificent flavor beyond the nostalgic and sought after outer crust. They may be baked , just turn often to achieve the texture contrast, but why compromise a good thing.? This recipe is great for game days or social gatherings because they may be cut into bite sized pieces or Popcorn Chicken Livers and are a grab and go treat! Spring a batch on your chicken liver nay sayers and watch how fast they realize what they've been missing for so long! Trim the livers of the fibrous connective membranes and cut into smaller bite sized pieces. Meanwhile, combine Worcestershire, fish sauce, sherry peppers and garlic in a small bowl. Pour over livers and marinate for 15 minutes to 1 hour. The longer you marinate, the deeper the flavor profile. Combine flour, pancake mix, onion and chili powders and shake well to blend. When ready, drain livers again but do not rinse. 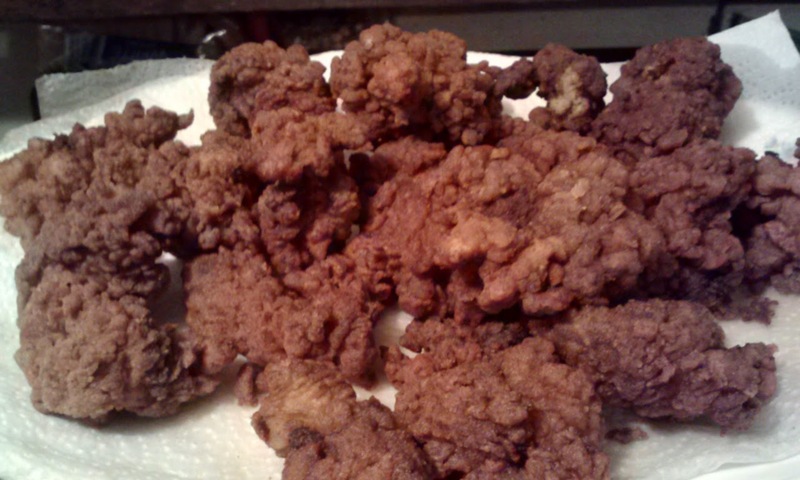 In two to three batches, toss livers in breading and carefully drop into oil. Fry until golden and floating, about 3 minutes per batch, drain on paper towels. Serves 4 as a main course and about 8 as 2 per portion appetizers. Garnish with fresh chopped parsley if desired. *If you don't have access to sherry peppers sauce, you may substitute with hot sauce or Sriracha. I am excited to say I was fortunate enough to discover Pawpaws in my area this late summer, something I had only heard of in song by Baloo the Bear in "Bare Necessities" (The Jungle Book) and childhood accounts of seeing the trees and eating the fruit while hiking from my older sister Gayle. Pawpaws grow here in the Eastern and Southern United States, about 26 native states. They are the largest edible fruit in the United States, and can weigh in up to a pound . Also, they were referred to by some as the "Indian Banana". Other nicknames include "poor man's banana, Kentucky banana, and American custard apple". Pawpaws are a delicious and fragrant fruit, which taste like a cross between a banana and a mango to some, with subtle hints of melon and pineapple. The pulp is very unctuous and custard-like, very much like an avocado, a perfect consistency for smoothies. Pawpaws are also a suitable substitute for bananas for certain recipes. They have about 2 grams of fat per serving, and a host of vitamins and minerals including 130% of the RDA for manganese. There are a plethora of other essential nutrients, some surpassing that of apples, oranges and bananas in some areas, upwards of 100 times! Quite an American Super fruit huh! The seeds of the Pawpaw, which resemble kidney beans, are not poisonous, but are toxic if eaten, and can possibly cause some gastrointestinal issues like upset stomach or diarrhea. Be sure to REMOVE them before blending or using in any recipe. The shelf life of a Pawpaw is only several days once fully ripened, but will keep for a week if refrigerated. They may be pureed and frozen however, so do not despair. 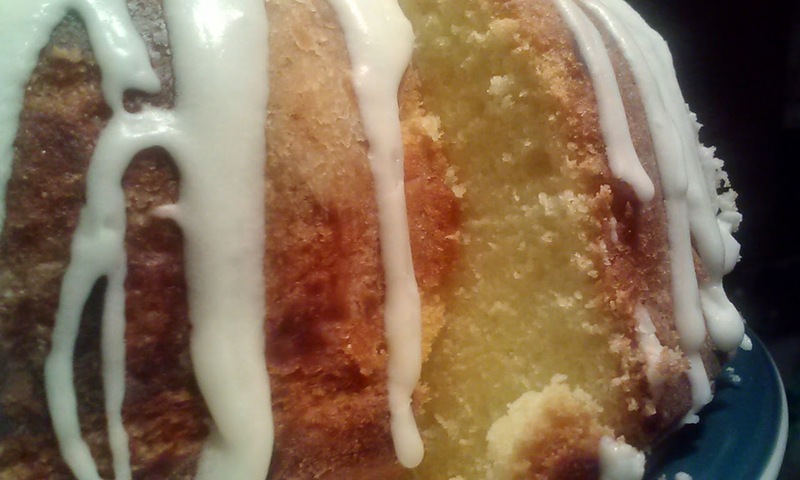 My first recipe using Pawpaws is the feature of this article, a pound cake. My brother in law, J.R brought me this wonderful batch of goodness and I am super thankful that he thinks of me when coming across new and different items for me to use in my passion for cooking. He also provides me with wild game and fish, many of which are featured on my blog. 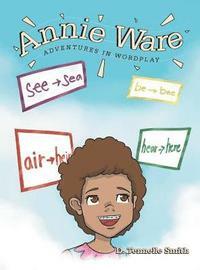 I received rave reviews and my family members are waiting for the next one. I will be making several more to share during this harvest season ( which runs roughly from late August to Mid-October) before freezing some for more fragrant and fabulous dishes in the future! Combine dry ingredients until well blended. In another bowl, cream sugar, eggs, butter, milk, and pulp. Mix in flour in two batches, careful not to overwork batter, producing a tough cake. Pour into a greased and floured bundt pan, tapping on hard surface to release any air pockets. Bake until toothpick or skewer inserted comes out clean, about 55 minutes. Let cool for about 10 minutes, then transfer to wire rack to cool completely. In a medium bowl, combine confectioner's sugar, butter, vanilla and salt. Add milk slowly until you reach the desired consistency. Fold or stir in lemon zest. Spread or pour over cooled cake. 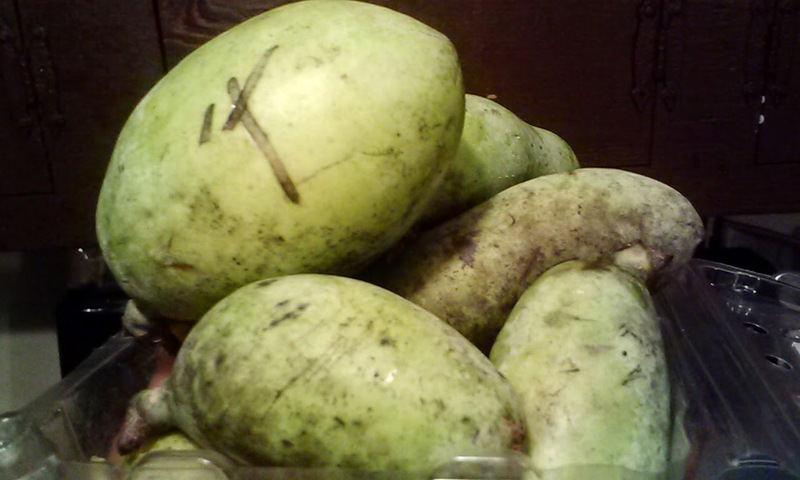 *Paw Paws should be peeled and de-seeded before use. Ripe Paw Paws smell fantastically fragrant and will yield to a gentle touch. The outside will be speckled with dark spots,but the insides will be soft and bright. I found that the best way to remove the seeds was to wear plastic gloves and squeeze the peeled fruit in a fist over a bowl or plate. Some of the seeds will pop out from the sides of your palm and the viable pulp may be scraped from the gloves. Messy, but effective!! 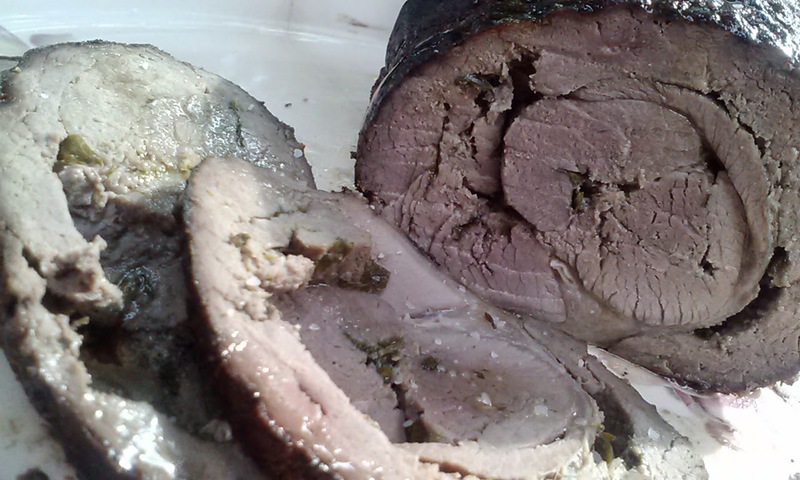 Herbed Venison Roast w/ Brown Sugar and Ponzu, Happy Hunting! 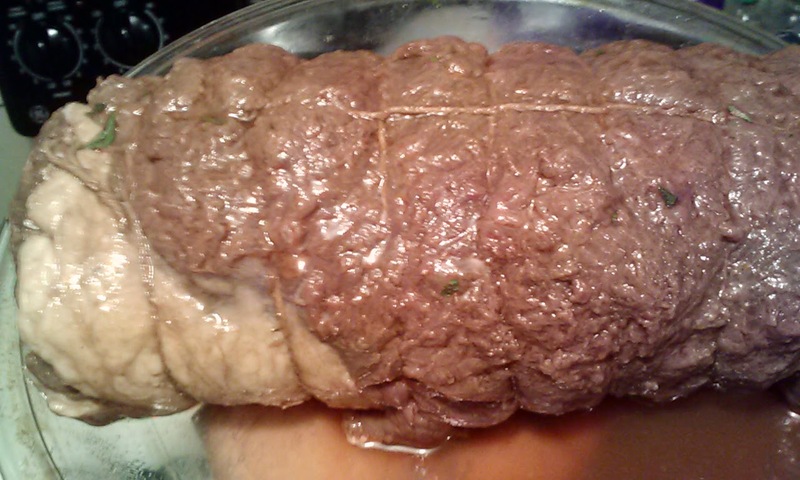 Place portion of roast between sheets of plastic wrap and pound to about 1/4 inch thickness. 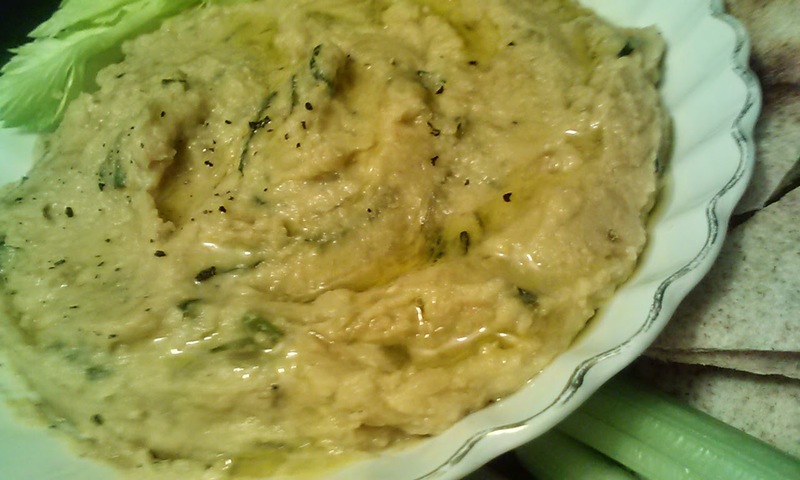 Combine herbs and garlic with olive oil and garlic plus SPST and spread evenly over pounded roast. Tuck ends and roll starting on short side until it looks like a jelly roll. Combine equal parts Ponzu and Brown sugar and 1 part Sherry Peppers and blend well. Pour over roast and turn to coat. Let stand turning often for about 15 minutes. Pat dry and sear on grill pan or in a large saute pan. Transfer to smoker or oven and cook until desired temperature is reached. If using an oven , roast @ 250*F , for several hours or until desired doneness is reached. 145*F for medium, 160*F for well done. 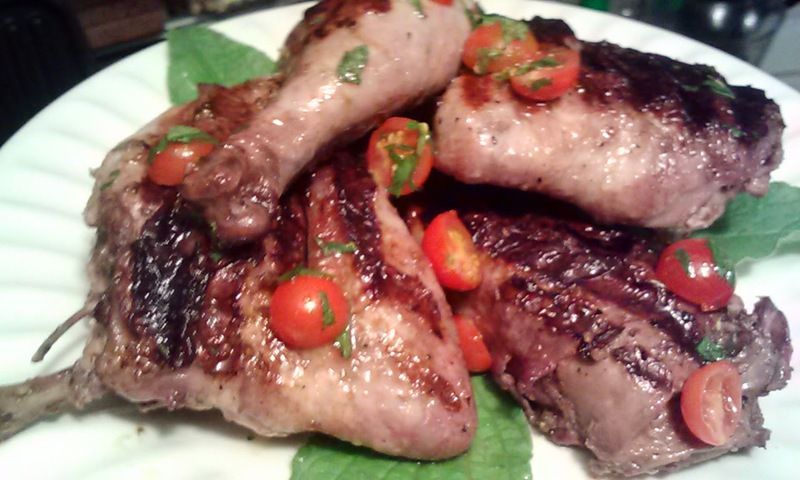 Baste periodically in Ponzu, brown sugar and sherry peppers to add more flavor and rich color to outer surface. 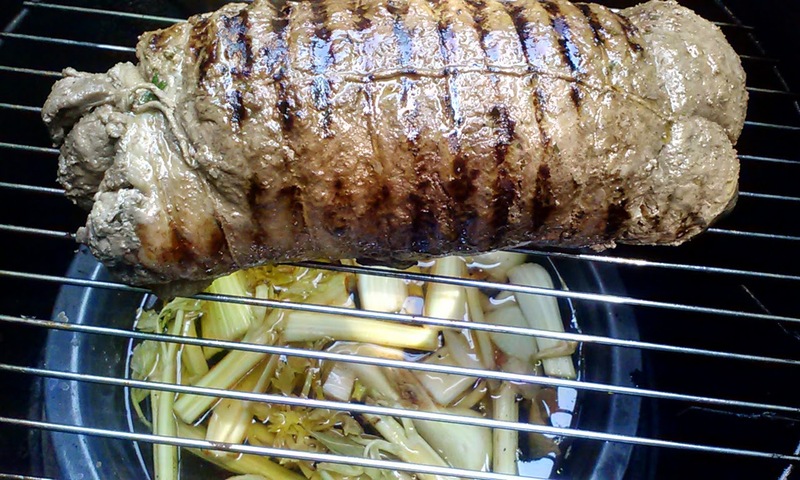 Infuse water in smoker with aromatics like onions, celery and garlic, and SPST. My neighbor Gloria brought me by several pattypan squash from her family's garden. I have always thought they were visually appealing, but I had not cooked with them before. I used that time to do some lab work and decided on a soup, composed of the roasted product and a few other simple and complimentary ingredients like curry and corn. The pattypans have a flavor reminiscent of corn and smells like corn when it cooks. The curry adds a subtle and complex element to the flavor profile. 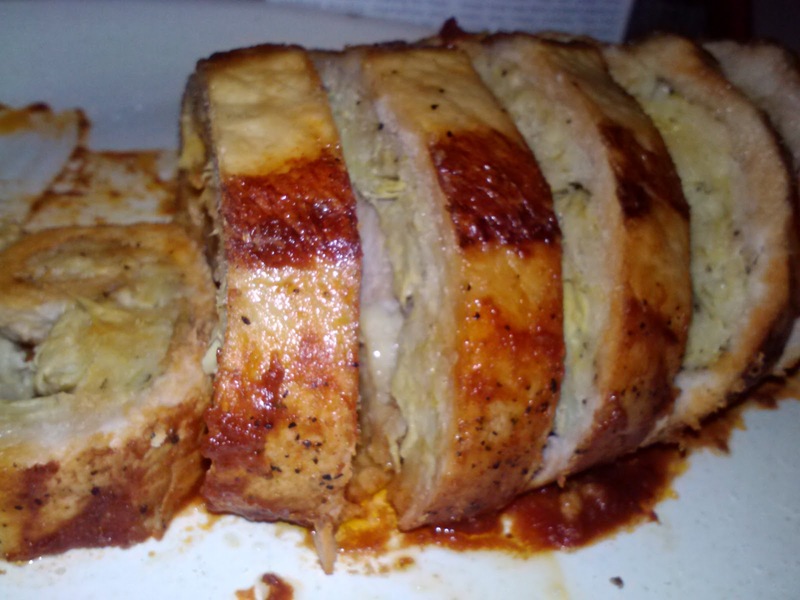 This recipe is relatively inexpensive to prepare and was received well by the family. This soup, paired with a green salad or sandwich makes for a fabulous light lunch or alone for a first course for dinner. Cut squash in half crosswise, and place on a roasting pan. Roast until tender, about 25 minutes. Remove from oven and let cool enough to handle. Scoop out seeds and center membrane, discard. Place pulp in medium bowl and cream w/immersion blender or use a food processor. Place in strainer and drain for 10 minutes to rid of excess water. Over medium high heat in a heavy bottomed vessel, melt butter and drizzle in a little olive oil. Once hot, add onions, bouillon and bay leaf..
Cook for several minutes until onions are translucent. Add squash and milk , reduce heat to medium. Heat to a slight boil, then reduce to a simmer. Simmer 5 minutes and remove bay leaf. Continue simmer until corn heats through, about 5 minutes. Garnish with parsley sprig and drizzle with olive oil if desired. NOTE: Fresh corn may be roasted along with squash to add to depth of the flavor profile and may be done ahead of time for efficiency. Creamy Sausage, Mushroom and Parmesan Cheese Dip, Tailgating Gourmet! I created this dip for our Super Bowl gathering this year, but since it's time for some football again, why not share it now and it can tag along with some tailgaters . It's a warm and hearty dip, perfect for tortilla chips, especially the scoop kind! This dip is substantial enough to stave off hunger and provide lasting energy to yell and scream for your favorite team, while drinking your favorite beverages!! There are lots of fresh sliced mushrooms swimming in luscious, creamy and stretchy Parmesan cheese, both sauce and freshly grated, and wonderful bits of good quality sage sausage, a winning recipe for a hopefully winning team's day! In a large saute pan over medium high heat, crumble sausage ( I use a potato masher for nice even morsels ) and brown, about 5 minutes. Cook until mushrooms release moisture and onions are translucent, about 5-7 minutes. Drain off excess fat and push contents to one side of pan. Cook flour for about 1 minute, then incorporate sausage mixture in with it. Remove from heat to add milk. Return to heat and stir often while waiting to thicken, about 5 minutes. Reduce heat to medium and let simmer for several more minutes. Pour into shallow baking dish and sprinkle with grated Parmesan. Bake about 15 minutes until bubbly. Turn on broiler to brown the cheesy top. Serve with tortilla chips or scoop style , Doritos for an ultimate experience! After spending seven fabulous days at North Myrtle Beach with my BFF R.D. Fisher and his family, needless to say we still had some libations remaining, which included Lime-A-Ritas!(Anheuser-Busch) . Later the same evening after returning home, it hit me that the basic premises of the beverage included many elements of a typical glaze of sorts i.e, sugar, alcohol, citrus.. so I thought it would be great as a reduced pan sauce!! 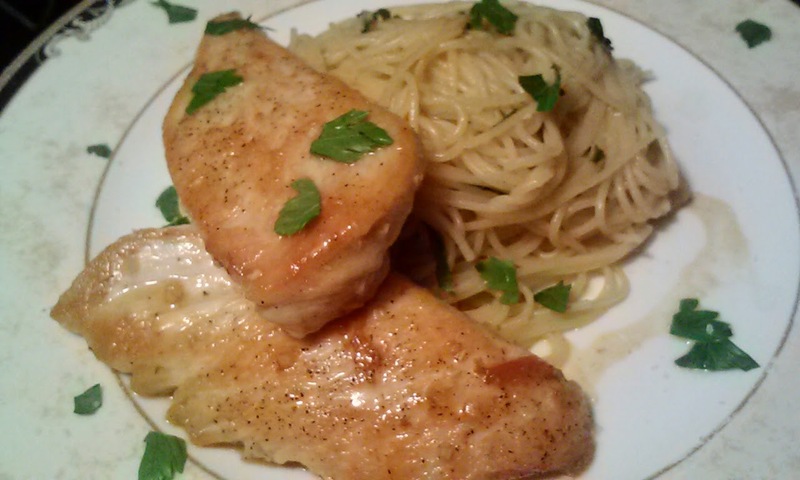 With the addition of some corn starch, pineapple juice, garlic, fresh parsley, cilantro seasoning and butter, this beverage transformed into a delicious sauce to glaze the chicken and toss with the angel hair pasta, bright and fragrant, satisfying. Eating your drinks has never been more fun! 1 can Lime -A-Rita, 8 oz. Over medium high heat in a large saute pan, add bacon fat or olive oil. Add cutlets that have been patted dry and SPST. Do this in two batches as not to crowd the pan., about 3 minutes per side. Transfer chicken to plate until all is seared on both sides. Remove pan from heat and deglaze with beer. Here is where you drop your pasta into pasta water. Return to heat and let go for about 1 minute to cook off alcohol. 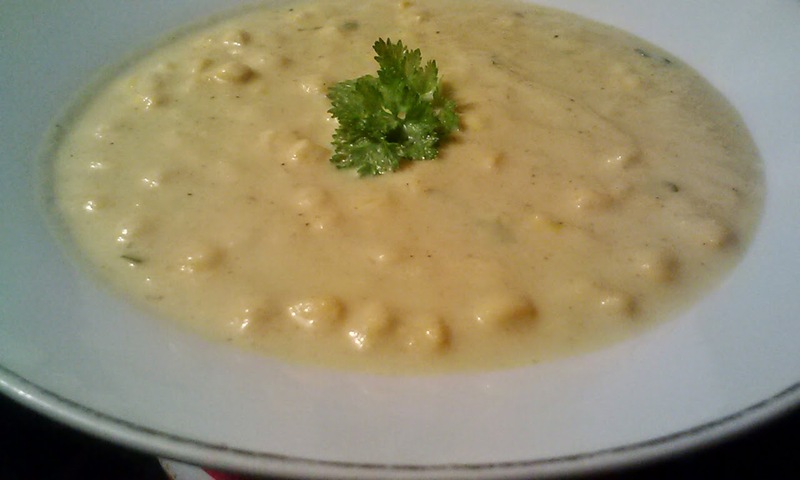 Remove from heat again and add remaining ingredients, whisking to incorporate corn starch and bring back up to a boil. After bringing up to a boil, Reduce heat to medium and add chicken and toss to coat. Remove chicken and transfer to serving platter and add Capellini and toss to coat. An inexpensive vegetarian take on a Southern American classic, this recipe is easy on the digestive system and teeming with Vitamins E, D ,K, protein and fiber. Indulgent in a way, but not too imposing on the waistline, especially for an occasional splurge. 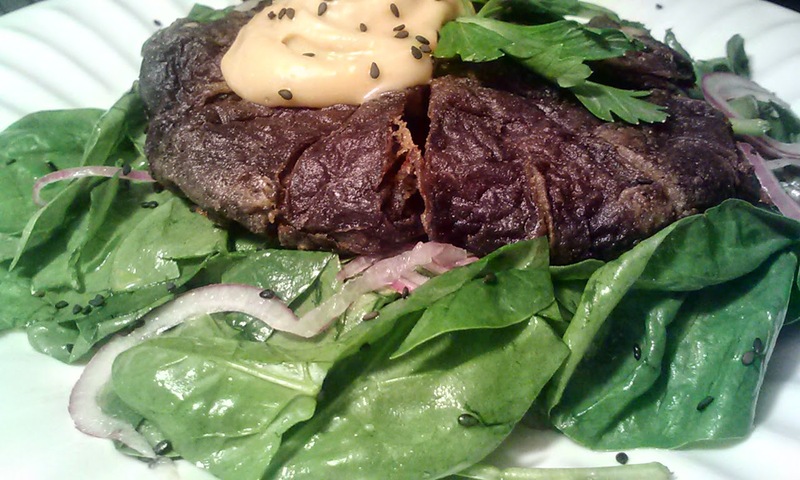 I originally planned to fashion the portobello as an appetizer dish, thinking the breaded fungus would fan out like a flower blossom when fried, to be torn off in strips and dipped in the delicious Red Miso Mayonnaise. Alas, my theory went awry to a degree, and when life serves you lemons, Make Lemonade! The portobello was still as tasty as ever, but not presenting itself in an appetizer form I would accept, so I took it to the entree arena and with a few other wonderful and flavorful ingredients, felt accomplished enough to share! 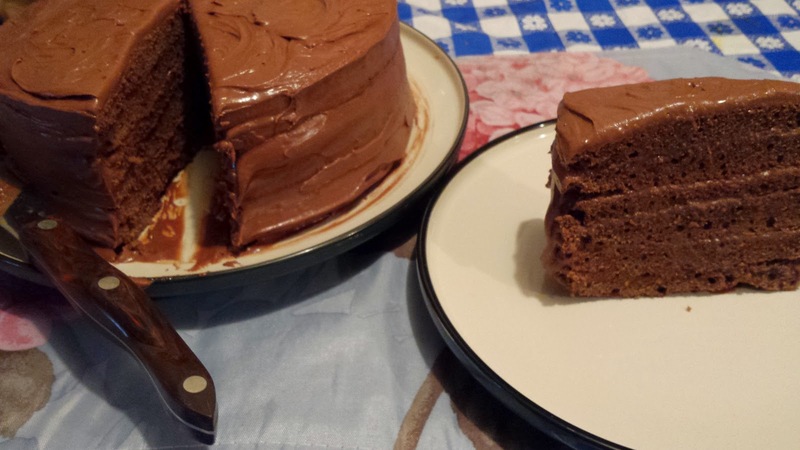 My sisters Cherie, Hollie, and Gayle really enjoyed this recipe as did I. My mom may have, but she abhors mushrooms, so she refused to try it, especially since she could actually see the portobello in plain sight! My mom is funny like that. No worries though, because she is my most discerning critic, whose feedback on the many dishes she does taste and enjoys, is tantamount to that of a world class chef, and I, her loyal and grateful minion.! 2 Portobellos, about 8 oz. Make slits around circumference of portobellos and dredge in flour. Deep fry for several minutes until portobellos float and are deeply browned, drain well on paper towels. Meanwhile, mix mayo and miso together in a small bowl and set aside. Toss spinach with rice vinegar and olive oil, SPST. 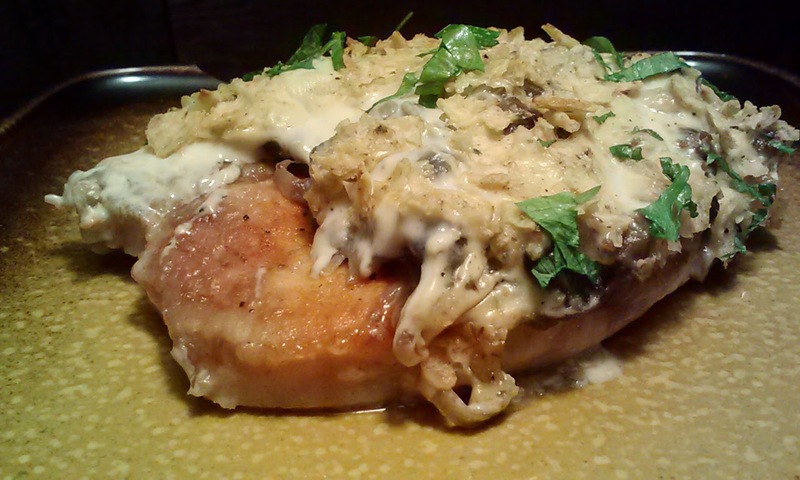 Top with portobellos and divide the mayo between the two. Garnish with black sesame seeds and serve immediately. This is a super easy, fun and satisfying recipe developed when I received a jar of my sister Gayle's homemade salsa. The ingredients were all fresh from her garden, bursting with color and flavor, spiked with some subtle heat, from banana peppers and some habanero . I had some fresh portobellos to utilize and it was around breakfast time, almost immediately, I thought about Huevos Rancheros. This is my take on the dish, which reminds me of a monster's or tired person's eyes, hence the name. My sisters Gayle, Hollie and Cherie tasted and loved the creation, as did I. I especially enjoyed the various degrees of heat throughout the flavor profile. I can't wait til Halloween to serve this dish for breakfast, lunch or maybe even an angry dinner!! This recipe is written for 2, but may easily be doubled , tripled or quadrupled! A larger shallow baking vessel will suffice when making for more than 2. 2 portobellos, about 7 oz. Using a knife, cut out center of portobello, about 1 1/2 inches across to house egg. In a small baking vessel drizzled with olive oil, pour in salsa. 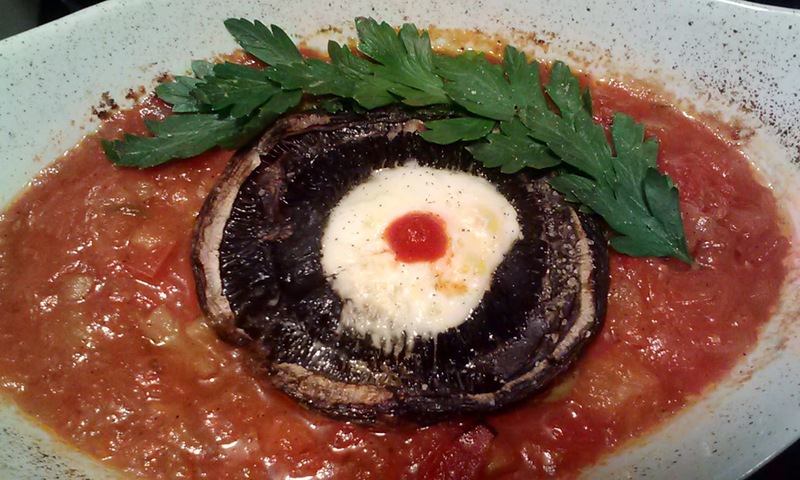 Crack egg into center of mushroom and drizzle with olive oil and SPST. Bake until egg is set to desired consistency, about 8 minutes for fully cooked. Create brow with parsley, the pupil with Sriracha and sprinkle with Cheddar cheese if desired. Zucchini and squash are two wonderful and versatile additions to any meal plan, but oftentimes those who are unfamiliar with them, shy away from preparing or even trying these vitamin and mineral rich gems. Enter the casserole. I didn't create the recipe to hide the veggies, just to present them in a different manner and alongside some sure fire favorites like potatoes and cheese! The flavors marry flawlessly and everyone can use some extra veggies in their diet. Hearty and comforting, this recipe is perfect for holidays, potluck or Sunday dinner, delicious enough to be served a la carte or as a vegetarian entree! Yellow squash is also featured in this dish, as it was a part of that day's harvest, but zucchini may be used in it's place. In a heavy bottomed pot or dutch oven, melt butter over medium heat. Drizzled in about 1 tsp. olive oil. Add flour and cook for additional minute. Add zucchini, squash and bouillon cube. Cook for several more minutes, allowing zucchini to release some of it's water and absorb flavors, stirring often. Add milk and bring up to a subtle boil and continue cooking until milk is thickened. Once smooth, temper in eggs. Toss potatoes and parsley together and SPST. Spread potatoes evenly in a 4 quart ,greased baking vessel. Pour in cheese sauce and fold into potatoes. Cover tightly with foil and bake until potatoes are tender and the eggs have set, about 40 minutes. Remove foil to slightly brown the top. Let stand for about 10 minutes before serving. 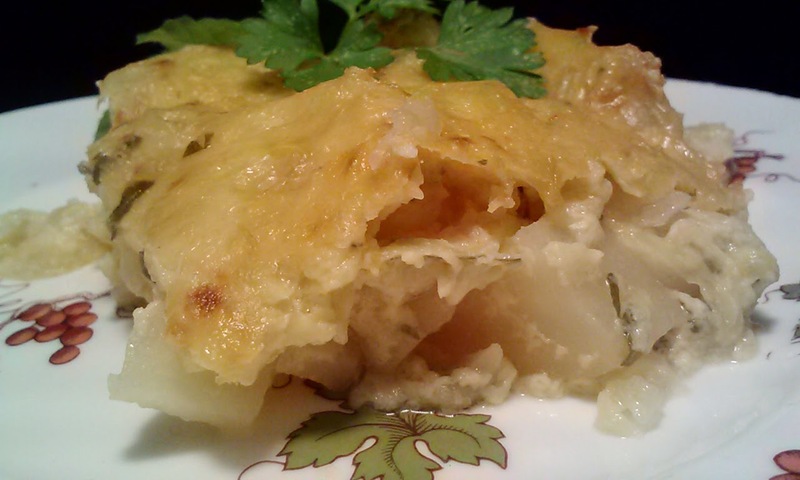 Looking for a quick, easy and delicious addition to any weeknight meal featuring a firm fish? 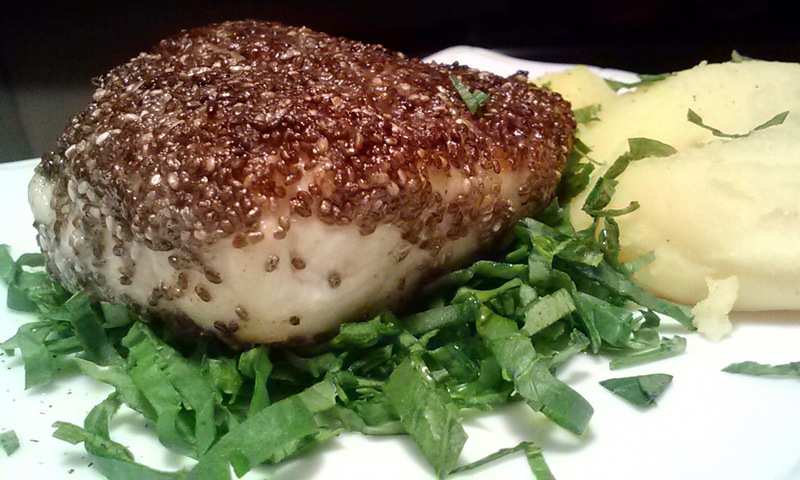 This recipe is fantastic and flecked with heart healthy Chia seeds and nestled on fresh spinach. My brother in law brought me a fabulous batch of freshly caught striped bass, and as always, I use those occasions to develop as many recipes using it in it's peak form as possible. This is one of them. The fish turns out flavorful and light, easily fitting into any diet, plus it is gluten free and relatively fat free, but you won't miss one beat! Perfect for an upscale dinner at home, pairing well with a white wine, like a Gewurztraminer or Riesling , complimenting the nutty notes of the Chia Seed as well as the fish. Serve with Quinoa or Couscous for an over the top presentation to please the palate. Place Chia seeds in shallow dish. Grate cilantro cube into dish and stir. Press fillets that have been patted dry into seeds on ONE side only, coating fully. Drizzle olive oil into oven-safe saute pan heated to medium high and sear fish portions, seed side down. After several minutes, turn fillets and sear non-seeded side, about 3 minutes each side . Transfer to oven and bake until internal temperaure reaches 145*F, about 7 minutes. Toss spinach with a drizzle of olive oil and SPST. Divide spinach between two plates. Nestle fillets atop. Serve with desired starch, shown above with Mashed Potato Quenelles. This recipe came to me when I was having fun with the copious amounts of zucchini I had on hand from our garden. I wanted something simple delicious and light, also low on carbs and fats. I used a mandolin to fashion the zucchini into 'spaghetti'. 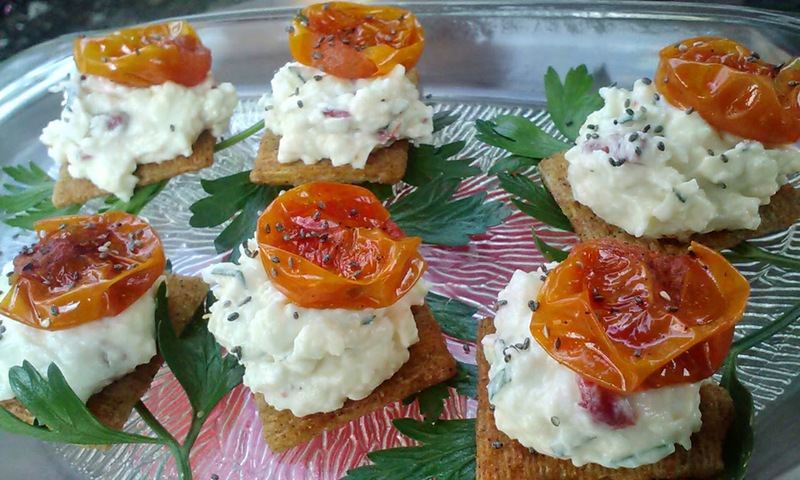 The cherry tomatoes just add a splash of color and some lycopene for heart health! Serve over rice or other grain for a longer lasting fullness and to stretch your dollar. In a medium bowl, combine garlic, fish sauce, sherry peppers, brown sugar, corn starch and red pepper flakes. Add shrimp, marinate for 15 minutes. When ready, heat large saute pan to medium high, drizzle with olive oil and add butter. 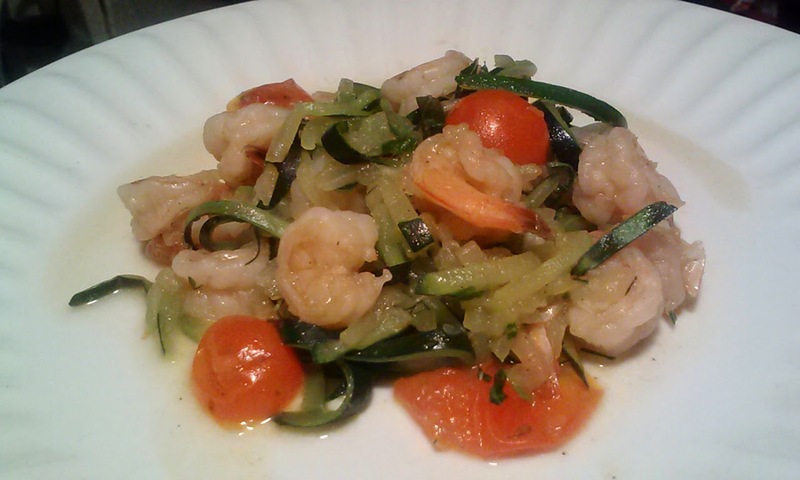 Once hot, add zucchini and onion, SPST, stirring often and rapidly, cooking for about 2 minutes. Add shrimp and marinade, and contunue to bringing up to a boil. cooking until shrimp is pink and sauce has thickened., about 3 minutes. Toss in cherry tomatoes and herbs. Remove from heat. Drizzle with olive oil and garnish with additional herbs if desired.. Serves 4-6, depending on if serving with grains or not. This is a simple and delicious spread that will not only compliment the cracker, but also veggies or any plain or multi-grain bread as a standalone finger or full sandwich. It is also an amazing addition to burgers! Pimento cheese or "caviar of the south" has been a Southern favorite for decades. The original ingredients include sharp cheddar cheese, mayonnaise, pimento, salt, pepper and a few colloquial ingredients, depending on the region. It is also popular in the Philippines. I took the traditional and historically popular pimento cheese spread, and put my own personal spin on the recipe to deliver the same satisfaction with different and wonderful elements like removing the mayonnaise and replacing it with plain low-fat Greek yogurt, sharp white cheddar instead of traditional sharp cheddar and a host of other flavor builders to enhance the flavor profile. The recipe is quick and easy to prepare and my family loved it. This spread may be made ahead of time and this version will keep for 2 days, not that it will last that long! In a medium bowl, combine cheese, Greek yogurt, garlic and sherry peppers. Using processor or immersion blender, blend until desired texture is achieved, I like to leave it slightly chunky for texture. Fold in parsley and pimento. Squash is a delicious and nutritious way to feed your family , and is gentle on the budget, especially if you grow your own. I came up with this sauce to utilize some freshly steamed squash I had on hand. I created a coarse and creamy sauce to compliment some potato gnocchi I purchased . The Brie lends a subtle yet amazingly creamy texture to the squash, which I blended, seeds and all , including all the nutrients and fiber, with my immersion blender. I used turmeric, which is a wonderful antioxidant and popular spice in Indian cooking for brightness and to add to the whole yellow squash effect. Parmesan cheese, milk and butter help round the sauce out and pairs well with pan seared chicken or pork! Prepare gnocchi according to package instruction, in salted water and drained. Meanwhile, melt butter over medium high heat and add flour. Cook flour for about one minute, then add squash puree, and milk. Reduce heat to medium and cook until thickened, stirring often, about 5 minutes. Once thickened, add Parmesan, garlic, onion powder, turmeric and SPST. Drizzle in a little olive oil and toss with the hot gnocchi. Garnish with olive oil and fresh parsley if desired. This recipe screams SUMMER and many of the fantastic flavors and smells that we seek, during these hot months . The portobellos are marinated, grilled and sliced, then layered with amazing and surprising complimentary vegetables like mixed spring greens with kale, julienne of cucumber, slices of fresh peach, along with some mozzarella and bacon for a smoky, salty finish. Whole wheat tortillas help bring in some fantastic whole grain goodness while sweet and tangy sauce ties things together. Very filling without the feeling of sluggishness. 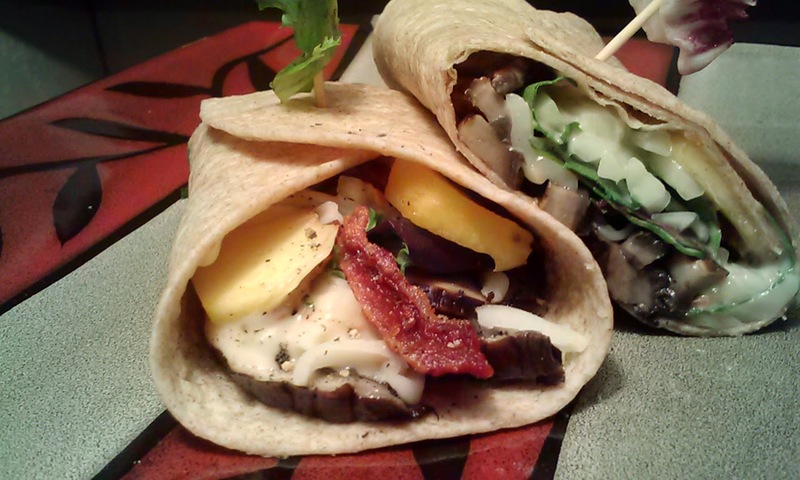 This wrap is light and fragrant and you don't have to feel guilty if you eat more than one. The bacon may be omitted for an equally delicious vegetarian meal or a perfect menu item for Meatless Monday or less meat any lunch or lite dinner! Combine worcestershire, fish sauce, sherry, olive oil, salt free seasoning and pepper flakes. Place portobellos in a shallow dish and pour marinade over them, flipping several times to coat. Meanwhile, preheat grill pan to medium high heat. Once hot, grill portobellos for about 4 minutes on each side, and let rest before slicing on bias. Arrange slices equally among tortillas and follow with cheese first, then veggies and fruit. Secure sides with toothpick and cut in half on a bias. Makes 4. This recipe was a real treat to create and was received very well by the family. With the costs of store bought hummus through the roof these days, it's a shame many don't take the time to just make it at home. Prep is a breeze and the results speak for themselves. Hummus is a great canvas to try new and different flavor combinations to suit your personal tastes. There are countless possibilities and you will save in the process . I enriched my recipe with fresh zucchini from the garden and caramelized onions. Garbanzo Beans or chick peas are rich in potassium, iron, protein and dietary fiber. They also contain Vitamin B6 and magnesium. Paired with some fresh veggies and whole wheat pita bread or toasted tortillas and you have a wonderful spread and smiles to that do the same from the first bite! I even threw in some fried hog jowl to pair with the country-feel that beans alone can create! In a large saute pan over medium high heat, melt butter and add olive oil. Once hot, add zucchini, onions, thyme and garlic. Cook for about 2 minutes or until fragrant and reduce heat to medium. Continue to cook, stirring periodically, until reduced to about 1 1/2 cups and the onions are golden , about 25 minutes. Meanwhile, puree or mash Garbanzo beans in a small bowl, this will be very thick, but the veggies will lend its creaminess when combined. Once veggies have cooled just slightly, combine them with mashed garbanzos in a folding fashion, drizzling in some olive oil and stirring with rubber spatula until incorporated evenly. Transfer to serving bowl and drizzle with more olive oil if desired. Makes about 2 cups. I served this dish at room temperature. *I used a mandolin for super thin, super easy slicing!! Creating this recipe was a real pleasure and produced delicious results. 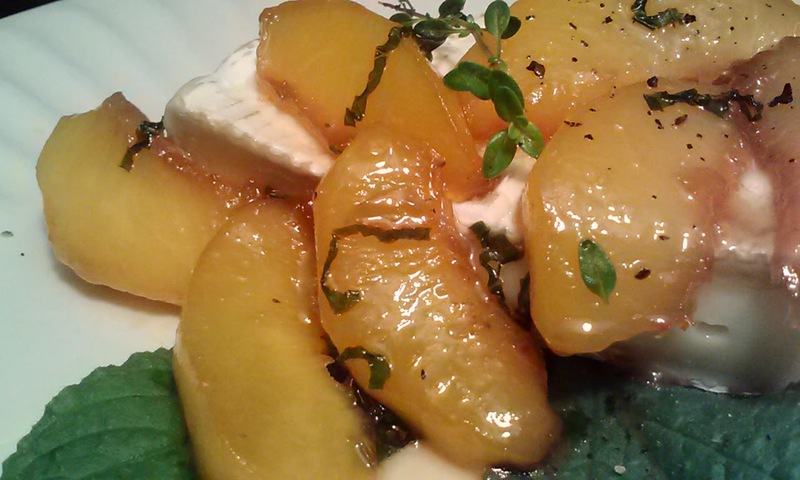 I love the freshness of Summer and the bright and wonderful flavors that accompany these months. I was able to procure many of these ingredients from my personal herb and veggie garden like thyme, parsley, borage leaves and the cherry tomatoes. The blackberries for this recipe were furnished by my dear friend Carter from the patch at his home. He was planning a cobbler for his berries! I wanted to take a different route this time, especially considering my girls ate 3/4 of the berries sprinkled with a bit of sugar, immediately after I brought them into the kitchen and rinsed them. I couldn't resist letting them enjoy these little guys fresh, because they are rich in Vitamins A and C, potassium, magnesium and anthocyanins, which are antioxidants that are contributory to heart health and cancer fighting agents. Anthocyanins are also responsible for the gorgeous red to purple hues of fruits and veggies, the more they have, the richer the color! I figured since this was a rather tart batch, they would make for a great marinade, infused with lemon, some herbs, garlic, sherry and fish sauce. The Tomato and Parsley Salad was contributed to add a splash of color and raw herb flavor, tossed with olive oil, vinegar and a pinch of salt. 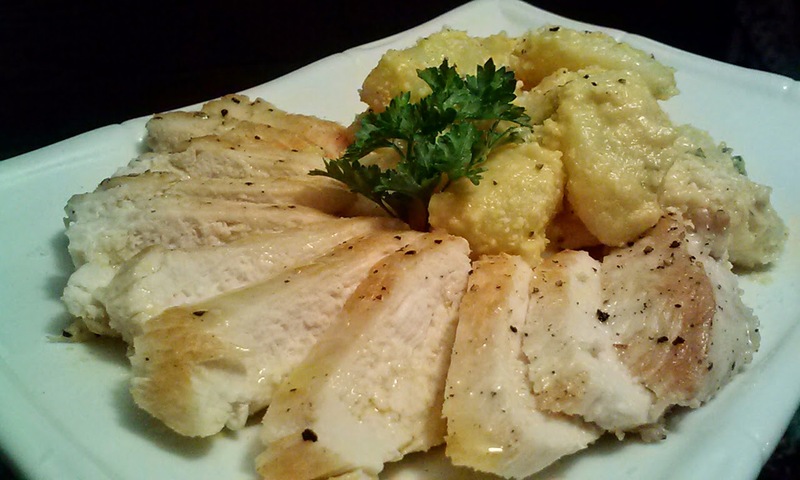 The salad provides a fantastic compliment and contrast to the flavor profile of the chicken. Carter has more berries to pick and I anticipate some other new and wonderful things to come....not to mention the berries ripening as we speak in the field behind our house, where the peach and pear trees are, as well as along the fence at the driveway! Country life ROCKS! Remove back bones from chickens and the breast bones , so they can lie as flat as possible and cut into four pieces each. Puree the blackberries, sherry, fish sauce and oil together. Send through a sieve or strainer to remove seeds if desired. Using an immersion blender or food processor, blend pureed berries, sugar, garlic, lemon juice and red pepper flakes until smooth, then stir in thyme leaves and zest. Coat and massage chicken in marinade, then transfer to large resealable bag, pressing out excess air. Marinate for 4 hours or overnight. Pour off excess marinade . Pat dry and drizzle with olive oil. Grill indoors or out, until juices run clear, or internal temperature reaches 165 *F, about 25 minutes. Meanwhile , prepare the salad. Combine ingredients in a small bowl and garnish chicken after resting and on serving plate. There's nothing quite like a BLT with fresh lettuce and tomato from the garden ( or grocer) with smoky, salty and crunchy bacon along for the harmonious ride. 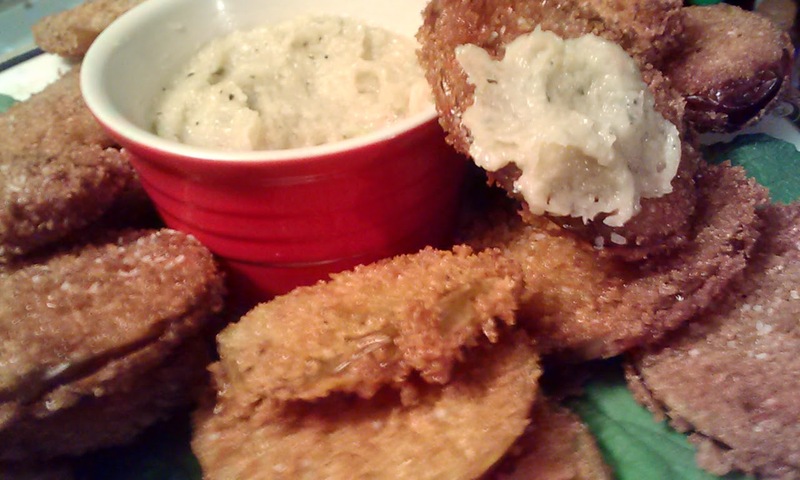 Adding an old time summer favorite of fried green tomatoes really sets the crunch and flavor factor on it's ear. I created a wonderful onion jam to slather on the tomatoes and this sandwich or any other delectable you desire with this naturally sweet and savory spread that pairs perfectly with the golden discs of tomato. I fondly remember my days as a girl, and my then best friend Danielle, we would raid our gardens religiously. We would gather tomatoes from our expansive garden for the ripe and ready to eat, grab the whole container of salt, and sit on our front porch to enjoy our literal shirt loads of tomatoes until we were full. Then on other days , we would scurry on to her family's garden and grab the biggest green tomatoes we could find. Danielle and I would go into their kitchen, at the time I had no place in ours,where she would fry those slices and we'd enjoy them hot from the pan! Those were some of the awesome memories amassed over the years, as precious as any fine stone or metal. Toss sliced tomatoes in seasoned flour and dip in egg wash.
Toss in Panko and Fry in 350* oil until floating and golden. Drain on paper towels and serve hot or warm. In a large saute pan over medium high heat, melt butter and add onions , brown sugar and thyme. Transfer to bowl and cream onions with an immersion blender or use a food processor. Pizza and mushrooms go hand in hand in our household. I figured , why not combine the two and get rid of the Gluten, some of the carbs and shave a substantial measure of fat , while receiving a healthy dose of Vitamin D and calcium. I found these beauties at Walmart, in a package boasting four beautiful Portobellos for less than 5 bucks!!! I was very pleased with the results of this recipe. My daughter Bronwyn LOVED it, as well as sisters Gayle, Bonnie and Hollie. The Portobello in all it's meatiness, leaves nothing to be desired and makes a wonderful and nutritious meal with the addition of a simple green salad!! This recipe may easily be doubled. Brush mushrooms with olive oil and sprinkle with scant amount of kosher salt on a baking sheet. Roast for ten minutes to extract some of the moisture and cook mushrooms, flat side down, flipping during last 3 minutes to rid of accumulated juices. Remove from oven and flip back to textured underside. Mix 1 tbsp. Parmesan cheese with sauce and divide among mushrooms. Place a slice of Provolone on each. 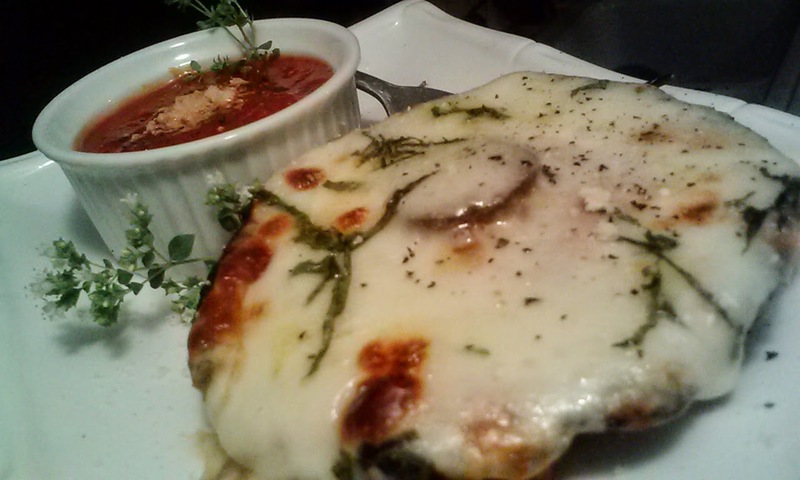 Divide mozzarella and fresh herbs among mushrooms. Drizzle with olive oil and Broil on bottom rack until slightly golden., about 5 minutes. Garnish with remaining Parmesan and SPST. Serves 2 or makes 4 appetizer portions. Breakfast, along with being the most important meal of the day, is also my favorite meal. Growing up, my parents left together for work at 6:25 every morning, give or take a few minutes, but never was this done without my mom preparing breakfast for the family. I recall those days before school and sometimes on Saturdays, my dad in the car blowing the horn, because mom had "just one more thing " to do or say, then out she went, her coffee oftentimes barely touched and still piping hot on the kitchen table. Not to be wasted of course, I relished in that special treat, knowing mom had prepared and sipped the creamy and delicious caramel tinted cup of goodness that sat before me. I love coffee to this day, probably beckoning to my carefree days of a blessed and loving childhood with memories unmatched. Sausage gravy is a great way to stretch your buck and feed more with the same amount of protein. This can be further achieved by adding more flour and more milk, depending on personal circumstances. 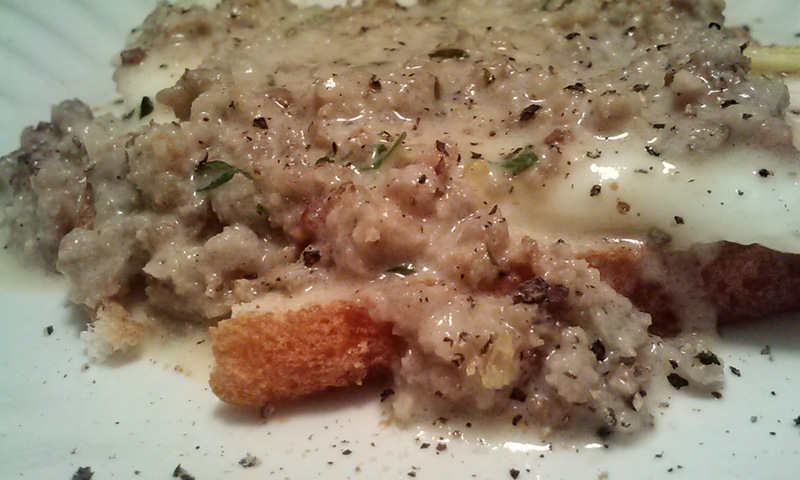 I have only been making it during this past ten years , here and there, but as I developed my prowess in the kitchen, a good go-to sausage gravy recipe became imminent. I feel this one fits the bill. Fresh thyme and parsley from my herb garden help create the homemade ,wholesome and highly regarded implement of color and flavor. Calories and fat may be regulated by the type of milk used and properly draining your sausage before creating the gravy. Turkey sausage may be used or even ground beef if desired. I chose to use beef bouillon to help tint the gravy and get away from the ( to me ) off-putting, yet equally delicious color of the regular white gravy version. Brown sausage over medium high heat with bouillon cube. Drain off rendered fat, leaving about 1 tsp. Move sausage to one side of the pan and brown flour, among the browned bits in the bottom of the pan. Incorporate into sausage and add milk (if using stock, add it here). Bring up to a boil and reduce to rolling simmer for about 5 minutes. Stir in butter and parsley and reduce heat to low. Serve hot, with biscuits or toast, and eggs any style you desire. Just about everyone loves green beans and have a surplus right about now from their gardens. I grew some last season, but this year I am able to enjoy fresh green beans from the sumptuous garden of my sister Gayle. She has quite a variety in tow, as well as three different types of green beans growing together. One day I dropped by her home , she is my next door neighbor, and she had picked several pounds of beans from her garden and offered me some, to which I of course obliged! I had some fresh mushrooms to utilize that I had purchased earlier in the week and thought the two would pair wonderfully! Packed with vitamins and minerals like magnesium,. 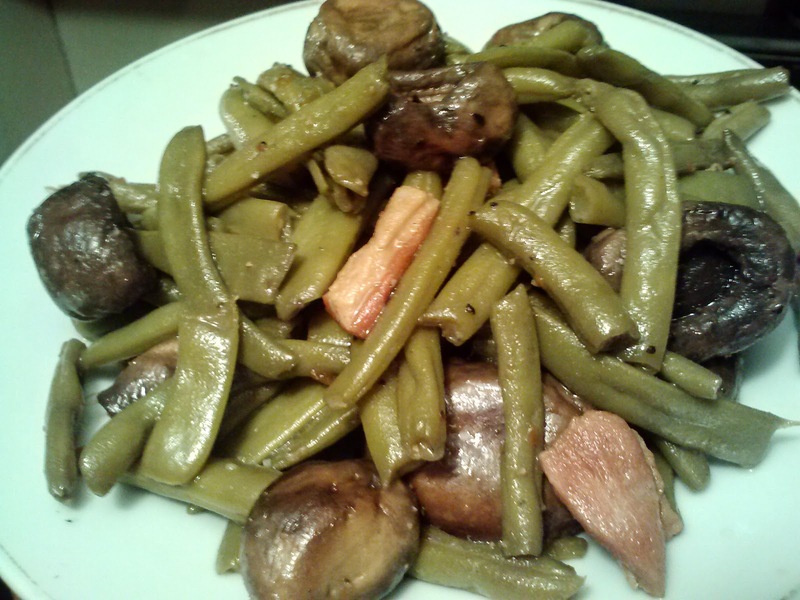 iron, Vitamin A , Vitamin B-6, calcium and potassium, fresh green beans are a great way to round out any meal. The earthy and meaty tasting mushrooms compliment this recipe perfectly, and I found my tasters enjoying this recipe as a stand alone dish, which totally rocks! Omit the salt pork and sub in olive oil for a satisfying and delicious vegetarian dish or meal! Toss green beans with Italian dressing packet and set aside. Render pork fat in microwave until crisp. While still hot, add to crock-pot, then add mushrooms. Stir to coat and simmer for about 10 minutes. Add green beans and fold together to coat well. Add lid and cook for about 2 hours or until desired tender-crispness! Summer is here and and so are the bounties of some wonderful fruit trees. Entertaining can be made easy and delicious with the addition of just a few pantry and herb garden items, for an impromptu appetizer that is light and fragrant, with nutritional benefits to boot like Potassium, Vitamin A and Vitamin C. I came up with this recipe as a result of peaches and Brie both being on sale ( the peaches on our tree aren't ripe yet and are much smaller) and I wanted an appetizer for family to critique for future gatherings. The finished product is full of fresh and bright flavors, with a hint of salty, provided by a splash of Sherry. Recipe may easily be doubled! 1 peach, sliced about 1 c.
In a medium pan over medium high heat, melt butter and add peaches . Saute for about one minute . Add brown sugar and continue for about one minute more. Add splash of sherry to de-glaze pan and remove from heat. Pour over Brie and garnish with fresh cracked pepper and Lime Thyme. This is an excellent salad for those extra warm to hot days, packed with fresh veggies, herbs and uber nutrients, and goes along perfectly with your favorite grilled fare especially chicken, pork and fish. Alone, this salad is the perfect base for protein enriched salads featuring canned tuna and canned chicken breast, just add mayo or salad dressing. My family and I have tried all three versions, and we were very pleased with all mediums in which it was served, especially the one with tuna! This recipe is a great way to utilize up and coming veggies in your gardens or that are given by your gardening friends! Briny, canned artichoke hearts pair amazingly well with the tropical-sweet pineapple segments and earthy fresh mushrooms. The vinaigrette for this recipe may easily be used to marinate proteins as well. Cook pasta in salted water until al dente, about 10 minutes. Blanch broccoli in pasta water during last two minutes of cooking, then skim out and transfer to ice bath or very cold water to stop cooking process. Drain and rinse pasta with cool water also. Combine all the salad ingredients in a large vessel and mix vinaigrette ingredients in a separate small vessel, whisking until well blended. SPST. Pour over salad and coat in a folding fashion with a large rubber spatula. Let stand for several minutes , folding often, allowing flavors to marry and serve or refrigerate until ready to use. May be served at room temperature. 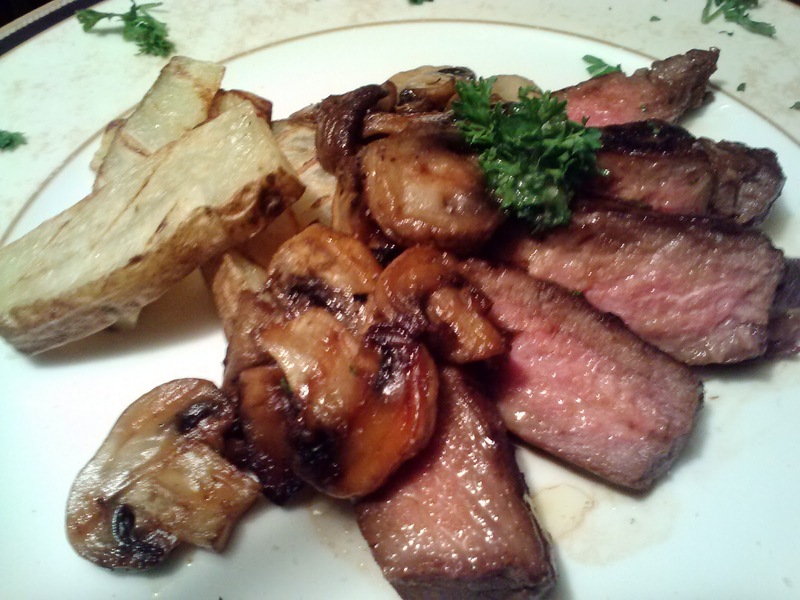 I felt that I had struck gold when I tried out a new marinade idea for steaks one day, so simple and fabulous I want to keep it a secret, but so delicious that I MUST share! You may be thinking, 'yeah, yeah, I've heard that before', but my tasters and I agree that this really brings the beef to life! The fish sauce adds umami notes and contributes to the beef 's simple but stunning flavor profile, while the un-sulfured molasses provides depth, color and only the slightest sweetness with major caramelization properties. Serve with your favorite veggies and starch and the meal will be a winner every time, broiled, baked or grilled! Whisk ingredients together and place in resealable bag. Toss steaks in bag to coat and press out excess air and seal. Marinate at room temperature for 15 to 30 minutes. Grill or cook as desired. This marinade will accommodate 4 steaks. 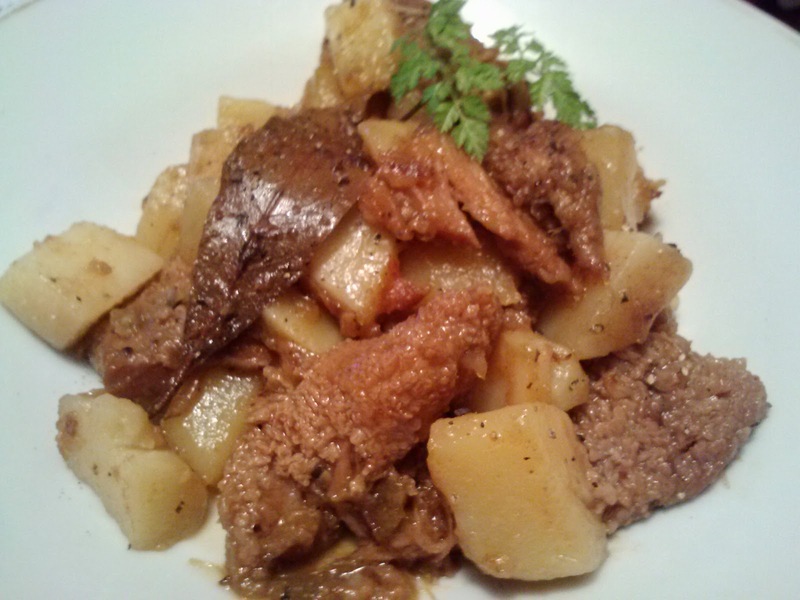 Tripe is an inexpensive and quite popular ingredient around the world and has been utilized for centuries. It is the stomach of an animal, particulaly cows. There are four types in Bovines, blanket, honeycomb, book and reed, honeycomb being the most revered. Getting some to jump on the bandwagon however, is a somewhat daunting task to say the least. Beef tripe falls into the category of Offal, or variety meats including internal organs and glands like sweetbreads, chittlins' and the stomach. Liver and kidneys is also in this group. Latin Americans enjoy cooking with tripe. I too have a recipe fashioned in that medium, Panza de Res y Chile Ajo, thinly sliced and fried or stewed. The French sometimes opt for the low and slow cooked method with vegetables and and/or wine and ciders, from which this recipe is inspired, minus the cider, Calvados and hoof!! (which is what the initial recipe and namesake includes) It is certainly worth the effort and the results are phenomenal. I originally ran across a recipe similar to this one while watching a syndicated show featuring Julia Child, The French Chef, teaching Americans how to cook like the French debuting in the early 60's. As many well know, she is one of the pioneer chefs who brought French cooking to the average American kitchen. In a large dutch oven over medium high heat, drizzle with olive oil and add onions, celery, garlic, bay leaf and bouillon cubes. If using stock, add after the vegetables have cooked for several minutes and become aromatic. Add tripe and stir to coat. Fill vessel with enough water to cover protein and bring up to a boil. Once boiling, reduce to medium heat and cook for about 2 hours. After 2 hours, transfer to 350*F oven and bake for additional 8 hours or until unctuous broth remains and the tripe is very tender. Add more water or stock as needed during cooking process. Add potatoes and cook until fork tender, about 25 minutes. Remove bay leaf before serving. Garnish with Chervil or Parsley. Serve with crusty buttered bread if desired. Serves 8 to 10. 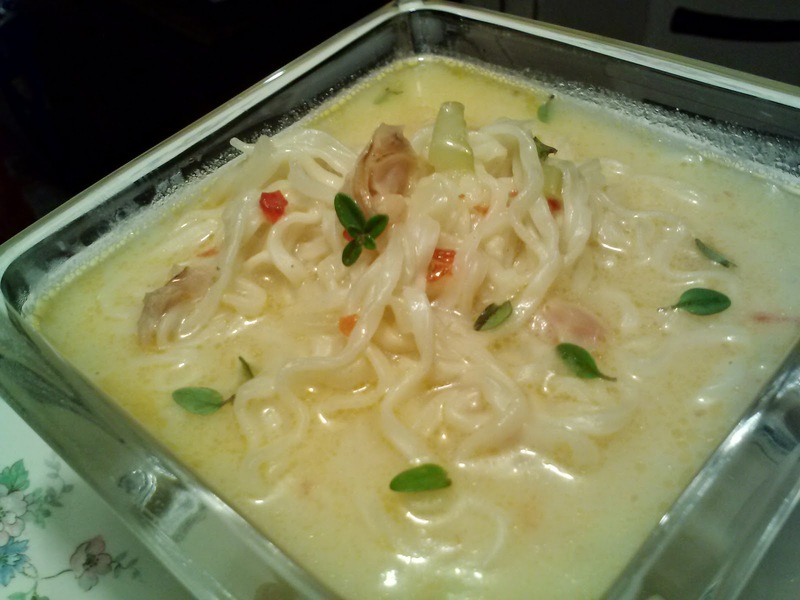 This recipe is my latest installment of Dormitory Favorites featuring Ramen noodles. It also happens to be my latest submission into a Ramen Noodle Contest . Versatility is this food's middle name and the possibilities are quite endless. I fashioned this dish in the style of a budget friendly clam chowder, which will serve as a filling and delicious up-spin to it's predecessor. The prep takes very little time and the results are fantastic. Complex and bright flavors help to make this recipe stand out among others. I was excited especially about using Lime Thyme from my herb garden for the first time. It was a wonderful gift from my nephew Rob, son of my sister Terry. The Farmer's Market in Roanoke, where he resides is fantastic, chock full of fresh produce, grass-fed beef , flowers, herbs, jewelry and crafts, along covered sidewalks, buzzing with patrons! We went on an excursion while I was visiting and I procured amazing finds like delicious organic and local herbed Chevre, local country ham, side meats, and chervil! Thanks for a wonderful time Robbie! In a heavy bottomed pot or dutch oven, melt butter over medium high heat. Add celery and onion and cook until translucent,about 4 minutes. Sprinkle in flour and cook additional minute. Whisk in water, sambal oelek and clam juice and bring up to a boil. Once boiling ,add Ramen and seasoning packets. Cook for about 4 minutes and turn off heat. Stir in coconut milk and clams. Garnish with Lime Thyme, Cilantro or both! Serves 4-6. 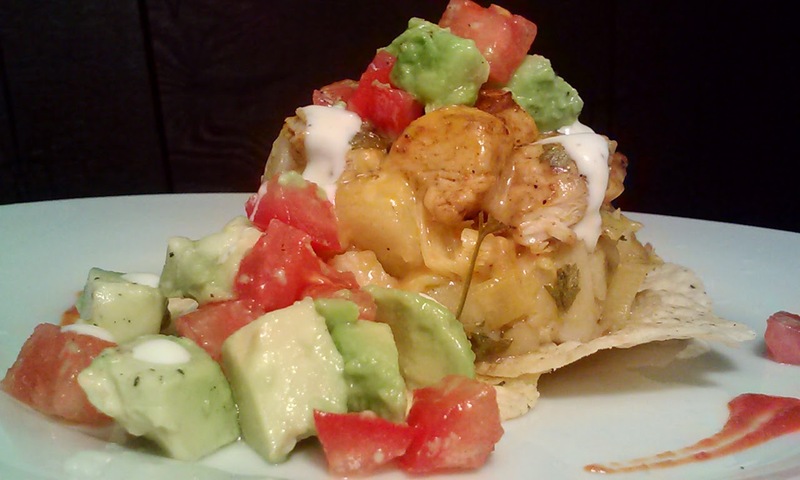 This recipe was created for a one dish meal commemorating Cinco de Mayo. Familiar and delicious flavors lace this simple to prepare and a joy to eat beef casserole filled with simple pantry ingredients and wonderful spices like cumin and chili powder. My 6 year old Bronwyn enjoyed the dish enough to request seconds as her after school snack the next day. 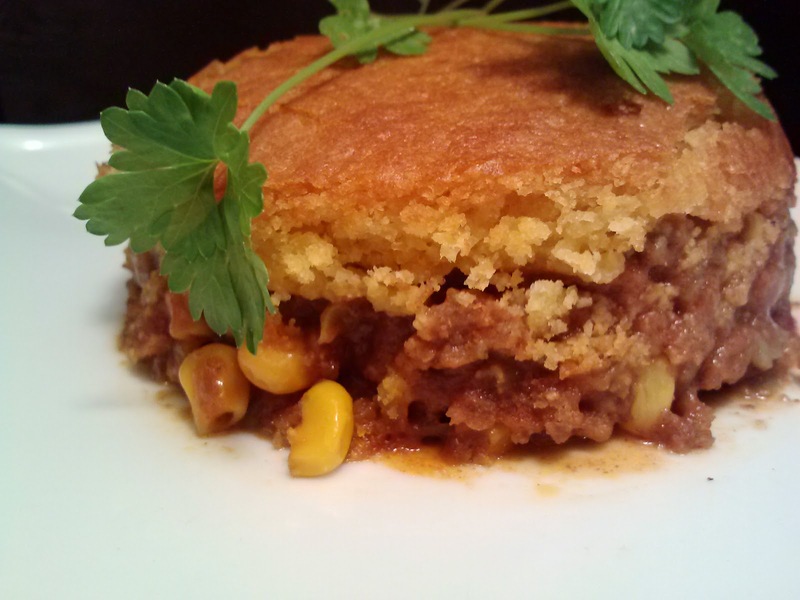 This dish of course can be enjoyed anytime and can be prepped ahead , just leave off the corn bread crust until ready to bake. In a large saute pan over medium high heat, brown beef with onion, celery and garlic. Add chili powder and cumin. Add tomatoes, soup, green beans, corn, cheese and salsa. Fold together and heat until bubbling, about 5 -7 minutes. Transfer to greased baking vessel and spread evenly. Stir until just blended and spread over beef mixture. Bake uncovered until golden, about 15 minutes then cover loosely and bake additional 15 -20 minutes. Let stand several minutes before serving. Feel free to halve recipe or prepare in two small dishes and freeze one for later. This recipe is another installment of my fun with stuffing things. This dish will make for an amazing dinner and presentation especially for the up and coming Mother's Day! The stuffing is filled with nutrient rich artichoke hearts,supplying substantial amounts of protein, iron, magnesium, Vitamin C and Vitamin B6. Additionally, it pairs well with the grated Parmesan and Oregano, picked fresh from my herb garden. Panko is the binder because of it's versatility and graceful yet subtle presence. Assembly is easy, only requiring minimal legwork. The loin I used is a portion of a whole loin, about 1 1/2 lbs to 2lbs., which has been butterflied and pounded to about 1/3 of an inch thickness. I am excited about any protein or recipe that involves using butcher's twine, but I misplaced it somewhere in the remodeling process in the kitchen lol. Alas, not being easily deterred, I simply wrapped the loin tightly in plastic wrap and refrigerated it for an hour or so to facilitate the idea of the loin keeping it's shape during searing and braising. Be sure to start the searing process seam side down. 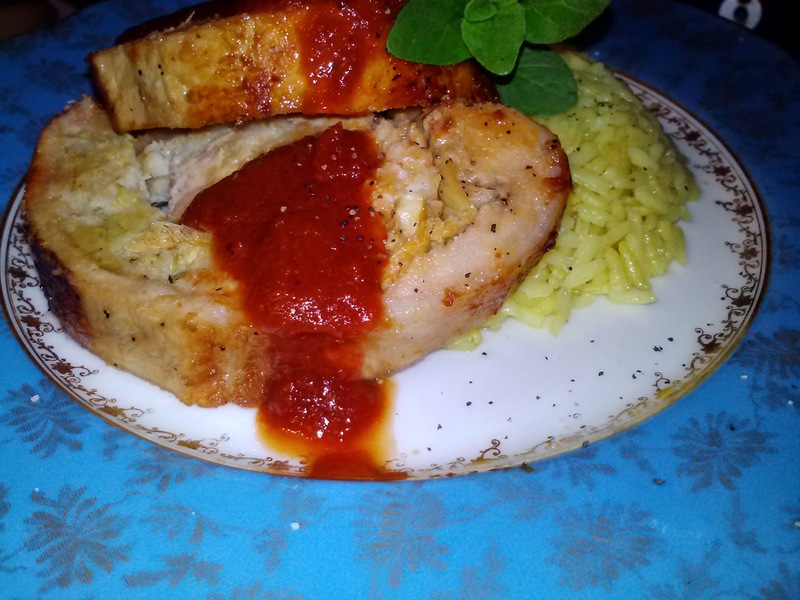 I served this loin with Garlicky Rice and the reduced crushed tomatoes, infused with bay leaf, garlic, olive oil and sugar to taste. Butterfly loin that has been rinsed and patted dry. Layer several overlapping pieces of plastic wrap on cutting surface, long enough to accommodate the flattening process. To Butterfly: Turn loin lengthwise, with short side facing you. With a sharp knife, make a cut across the top third portion of the loin to the opposite side, taking care to stop cutting about 1/2 inch from the end. Flip loin over and repeat process. Cover with several more pieces of plastic wrap and flatten or pound, using a rolling pin to about 1/3 inch thickness. Remove top layer of wrap and SPST. In a medium bowl, combine artichoke hearts, Panko, Parmesan, half of garlic, Oregano, Coriander and a drizzle of olive oil. Spread mixture within 1/2 inch of protein borders. Starting from one end, roll snugly lengthwise until cylinder is achieved. 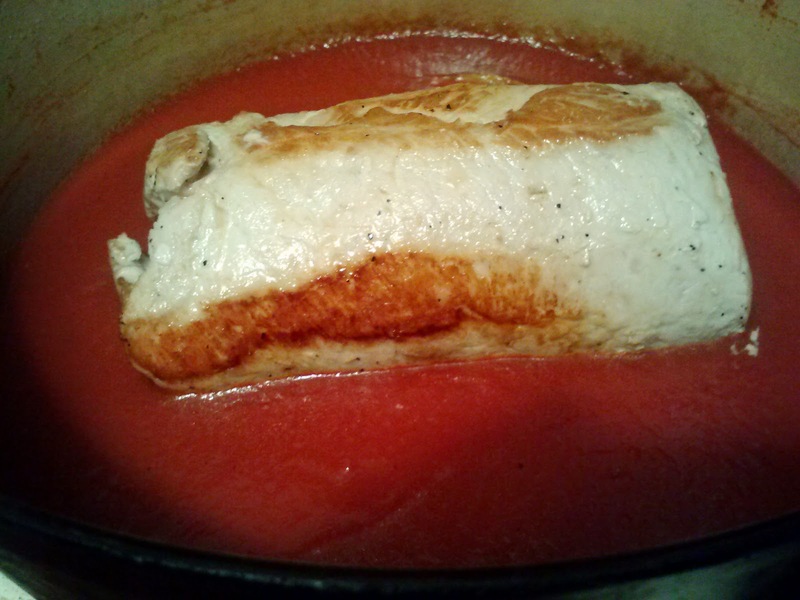 Alternately, tuck ends of loin and wrap loin tightly in bottom layer of wrap, folding in (like rolling a burrito) and refrigerate for at least an hour. In a dutch oven or heavy bottomed pot over medium high heat, drizzled liberally with olive oil, SPST outer loin and sear on all sides until browned. Remove from pot and reduce heat. Pour in crushed tomatoes and add bay leaf, remaining garlic, a drizzle of olive oil and sugar to taste. Let simmer, stirring often for about 5 minutes. Place loin back in pot. Cover and braise in oven WITHOUT basting until done, about 25 minutes. Remove from sauce and let stand before slicing. Serve as desired with tomato sauce Serves 4-6. Chicken wings are one of my favorite guilty pleasures, especially fried with tons of Sriracha and Chunky Bleu Cheese! The prices for these puppies seem to be battling those of gold bouillon in some stores, so I wanted to make the best of the purchase, sans frying, and take the chicken wings to new and exciting heights, no pun intended lol. With a simple packaged Chicken stuffing and some fresh diced mushrooms, I stuffed, then baked the wings until cooked through and golden. Serve these wings with savory sides like garlic mashed potatoes, glazed carrots and/or wilted spinach. My mom really liked the recipe and I beamed with pride because she is my most discerning critic! managed to stuff a chicken wing! Combine stuffing , mushrooms and stock . Remove tips from chicken wings, set aside for stock or other use. Make an incision about 1 inch long on the inside of the wing, where the fan-like skin is and carefully separate skin from meat as much as possible. With the knife separate the meat between the two flat wing bones for slightly more space. Stuff each wing with about 2 tbsp. stuffing mix and place stuffed side down in a lightly greased baking pan or dish. It is okay to fit the wings snugly end to front to help keep uniform as it cooks. After all wings have been stuffed, lightly brush with olive oil. Sprinkle with Paprika and SPST. Bake for 10-15 minutes uncovered, until start to turn golden, reduce heat to 350*, then bake about 20-25 minutes loosely fitted with foil. Transfer to paper towels for several minutes before plating.